Honeywell S8610U3009 universal intermittent pilot control for gas-fired furnaces, boilers and other heating apliances. Functional equivalent of S86, S8600, S8610 and S90 modules. 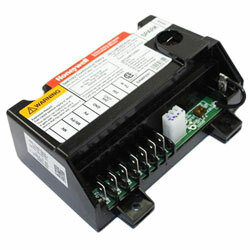 Replacement for most Honeywell, Robertshaw, Johnson, and UTEC (HSC) intermittent pilot modules. Uses existing intermittent pilot burner. Includes cross reference, instructions, and accessories for easy replacement. Provides 100 percent pilot gas shutoff if pilot fails to light; after 6-minute delay, trial for ignition is repeated. Ignition trial/delay sequence is repeated until the appliance lights or call for heat is removed. Includes spark cable adapters to allow field replacement of both Honeywell and competitive controls without replacing existing spark cable.